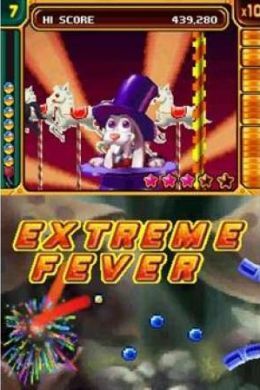 Once you clear all the orange pegs, the game goes into "Extreme Fever" mode. Gloriously over the top, Beethoven's Ode to Joy blares out of the speakers, rainbows streak across the screen as the ball bounces around in slow motion, racking up huge scores before finally landing in a pocket that awards even more points. On harder levels, or levels you've had to retry several times, you might just find yourself dancing around the room once you hit the last orange one. Extreme Fever - Feels like hometime on a Friday after a busy week, only more frequent and with rainbows. Unique to Peggle DS are the stars, hitting purple pegs awards stars. When you have five stars a golden peg appears, hit that, and you're transported to the "underground". Here the action takes place on both screens. You tap the screen to activate bumpers, which bounce the ball around collecting gems, before eventually falling into a bucket which awards bonus points. These bonus levels can be visited several times during a round. They don't add a great deal to the experience, most of the time it deteriorates into frantic screen prodding as you try to get the last few gems. Even a poor run on an underground level can award two or three free balls, so they are certainly worth going for. This has the effect of making Peggle Dual Shot easier than the PC version, since it's much easier to win free balls. It seems a strange decision to add a new element to a formula that has worked so successfully in the past and while the game isn't ruined by this addition it certainly feels like it was thrown in there just for the sake of it. Aside from this curious addition, the game contains the same levels that have entertained PC players for hours. The cartridge even includes all the boards from Peggle Nights, the expansion pack come sequel that PC owners had to shell out for. There's also a simple two player mode, where players take it in turns to play a shot, sharing one DS. Sadly there's no multi player download modes, which is a missed opportunity. The recently released Xbox 360 version included a party play mode over the Xbox live online gaming service. A similar mode could have easily been implemented via DS download play. There are other minor niggles too. The shoulder buttons are perfectly positioned for firing the ball while using the touch screen to aim, but instead your limited to tapping the launcher. It's also quite easy to accidentally activate the zoom function when planning a shot. The option to make the music in fever mode louder than the music and sound effects in regular play is also missing, this doesn't sound like much, but seasoned Peggle players will miss this. None of these problems stop Peggle DS being the definitive hand-held version of the classic game, however. Peggle is a game of luck and skill. Another popular game of luck and skill is Poker, a game played with old fashioned playing cards that's more popular now than it ever was. There's something compelling about the right balance of the two elements that makes certain games work brilliantly. Just as victory might be snatched from you by an unfortunate shot, next time around, lady luck can smile and you'll be on to the next stage. Maddeningly addictive, superbly presented and loved by players of all ages and abilities. Peggle DS is an essential part of any self-respecting DS owners collection.